The last few weeks of March brought South Africa close to a constitutional crisis. That this probably won’t happen has less to do with rationality and justice than it does with a culture of cover-up and state capture by the dominant faction of the ruling party. A number of African National Congress parliamentarians have revealed that they were offered posts in the national cabinet, not by President Jacob Zuma—whose job this is, according to the Constitution—but by representatives of a family-run Indian multinational corporation with substantial investments in South Africa, the Guptas. This family has a long history of political involvement in the country. The Guptas own the New Age, a pro-A.N.C. national newspaper, and the similarly sympathetic ANN7 television news channel. They have close business associations with the Zuma family and other A.N.C. heavyweights. If the allegations are true—and most South Africans in media and politics believe they are—this is a very serious situation in a country already reeling from other crises: severe drought, an economically destructive fight between factions of the A.N.C. supporting Zuma and those supporting finance minister Pravin Gordhan, the threat that South African bonds may be reduced to “junk” status and a pervasive sense that the ruling party is corrupt to the core. It means that the president has violated his oath of office under the Constitution—an impeachable offense. And it means that the domestic affairs of the country have been interfered with by a foreign power—not a state, in this instance, but a multinational. “So what’s new?” you might say. We all know this happens all the time. Presidents and political parties can be bought by business, even in the most stable of democracies. Foreign powers interfere with weak states all the time. Businesses manipulate politics. If a state is functioning efficiently, the economy must be sound and businesses need to be in on the process. In a normal society businesses advise, engage with government and, if they are dissatisfied, move capital elsewhere. If businesses, particularly multinationals, engage in direct intervention in a state by means like financing coups or putting “their” people into office and are found out, they are subject to prosecution within the state and international condemnation outside. And presidents who violate their oath of office get impeached. At the very least they are fired for not doing their job. Not in South Africa, it seems. When the news broke, the National Executive Committee of the A.N.C. met. 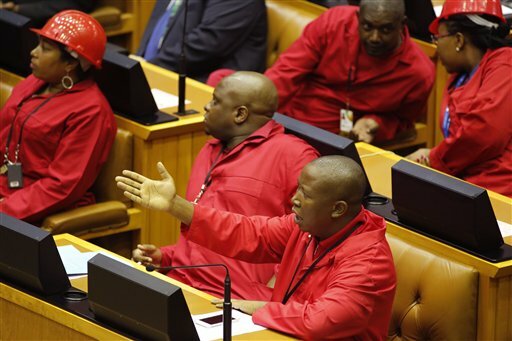 Though some on the executive committee, notably those close to Pravin Gordhan and key members belonging to the South African Communist Party (which is in alliance with the A.N.C. ), denounced the Guptas in general and condemned any notion of their involvement in affairs of state, Zuma was exonerated. The A.N.C. has also denied claims that Zuma offered to resign over the crisis. The fallout continues. Amid widespread anger against Zuma and his faction among sections of the A.N.C. (including many veterans of the anti-apartheid struggle) who are concerned that the party’s reputation has been further damaged, rumors spread of an imminent cabinet reshuffle, in effect a purge of Zuma’s critics. Prominent among those rumored for “redeployment” (to use the A.N.C. nomenclature) is Deputy Finance Minister Mcebisi Jonas, one of those who alleged they had been approached by the Guptas. Political analysts see it in wider terms: confirmation of their assessment that we are seeing party and state “capture” by the faction led by President Zuma, with an underlying intention of personal gain. Civil society is angry, too. Some feel—with justification—that the country is for sale to the highest bidder. Last week the Dominican order formally asked the public protector, Thuli Madonsela, to address the matter. She has indicated she will ask Parliament for funds to investigate. This article also appeared in print, under the headline "Country for Sale?," in the April 18, 2016 issue.